As a service to our members, ServeNow.com provides the following badges and icons for use on your websites and other marketing materials. 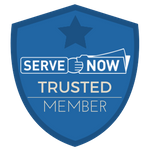 If you are a current and active ServeNow member in good standing, please use the below badges on your website(s). The corresponding HTML code is already provided for each badge. Please see which badge size and design best suits your needs. Copy the code below, then paste it into the HTML on your website in the desired location.